These rockets also generally weigh under a pound, but fly much higher than model rockets. In hobby rocketry, motors are given a letter designation which specifies the total impulse (overall productive energy) of the motor with a range. Each letter indicates a doubling of the energy in the prior range so a "B" motor is twice as powerful as an "A" and a "C" is four times as powerful as an "A" (and twice as powerful as a "B"). That said, not every "C" motor has the same total impulse. Any motor whose total impulse is greater than 5 Newton-seconds (Ns) and less than or equal to 10Ns is a C motor, even though a 5.01Ns motor is only half as powerful as a 10Ns motor. By the way, commercial motors are made up to "O" size (the limit of high-power rocketry) and a full O is 40,960Ns, equivalent to 2,048 "mighty D" motors. For motor information and simulator data, see ThrustCurve.org. The on-line community, primarily The Rocketry Forum provides a good forum to find out what other people are doing, get more information and ask questions. Take a look at the rec.models.rockets FAQ as well. The F.A.A. (Federal Aviation Administration) regulates the use of the sky. Note that flying higher than the start of controlled airspace requres an F.A.A. waiver. Controlled airspace height varies. It is often 1200 feet, but can drop down to zero in some areas (such as within five miles of an airport). The most confusing and difficult organization to deal with (at least historically) has been the B.A.T.F. In 2009, the hobby organizations won a legal battle that exempts most hobby rocket motors from the previous requirement of Low Explosives Users Permit (L.E.U.P). Rocket igniters which are called "electric matches" still require an explosives permit. Because rockets could damage airplanes, the F.A.A. requires that people launching rockets weighing more than one pound, made out of hard materials, or flying into controlled airspace obtain a waiver in advance. Waivers will generally not be granted in urban areas or near airports. Typical waivers for mid-power launches are 2500-5000 feet and high-power launches usually have waivers from 5000-25,000 feet. Some launches have waivers up to 100,000 feet, but these are rare and only given in very remote areas. It is rare for individuals to obtain waivers on their own, so generally high-power rockets are only launched at club launches. Note that most of these rules only come into play with larger rockets and more powerful motors. If you stick to model rocketry (weight < 1 pound, made of breakable materials and flying underneath the controlled airspace on pre-manufactured motors) you can launch in a local park (unless there are local ordinances). Just be careful of the infamous rocket-eating trees! From the Laws & Regulations section above, you can see that it takes a lot of work to set up a launch. 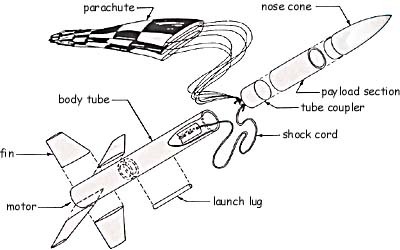 This task is generally undertaken by a rocket club for periodic organized launches. Clubs are basically mandatory for all but model rockets, but even model rocketeers benefit from club membership. You should make an effort to find a local club in your area. See the list of NAR Club Locator and Tripoli Prefectures for clubs in the U.S. and the list of C.A.R. Clubs for clubs in Canada. For high-power rocketry, the two largest companies are Loc/Precision and Public Missiles, Ltd. Anything in the Loc/Precision 1" through 4" kit series makes a good starter mid-power kit with high-power construction techniques and the Graduator and Forte are popular high-power kits. The P.M.L. Ariel and D-region Tomahawk are also good starter kits, and for the more adventurous, the Bull Puppy makes a great-looking rocket. Amateur rocketry is all about doing everything yourself, so no kits here. Some larger launches attract companies such as Thunderflame Associates which hold motor-making classes, but your best bet is to find other amateurs in your area and work with them. Scratch-building supplies can be purchased mail-orders from many vendors; when you browse my site, you will see kit and supplies vendors mentioned as appropriate. flyrockets.com has a good introduction to the hobby and another set of links.